Next month is NaPoWriMo - National Poetry Writing Month - and I've been neglecting the poetic form for too long. I love all the experimental methods of finding new ways to connect words and make language interesting, so when I read about the art of 'Book Spine Poetry' recently on Brain Pickings, I knew I had to try it for myself. Book Spine Poetry literally means to use the title on the spine of a book as a line of a poem. So simple yet so clever. And it makes me feel a lot less guilty about my Tsundoku habit. I have plenty of fodder to work with. Inspired by the art of Nina Katchadourian, and also the experiments of Maria Popova herself, author of Brain Pickings, I decided to have a go. I am always paying attention to the physical qualities of the books, and I try to work with their particular attributes as much as possible. The size of a book carries temperament and tonality, as does the way the text sits on the spine. A heavy volume with large text on the spine, for example, might be exuberant, urgent, pushy; a small typeface might communicate a voice that’s exacting, shy, insecure, or furtive. You can sign up to receive free daily poetry prompts from The Poetry School throughout April. I'm thinking Book Spine Poetry might be a good way to go! Does it...could it ever...snow on Mars? I don't know but this is another poem from my week-long Arvon retreat at Lumb Bank. We wrote 'stream of consciousness' style for 10 minutes, with the trigger 'I remember when...' which took me bounding back to childhood (of course it would). The twist was it also had to include 'an impossibility' - thanks Stevie! (though Monday's have always been brown). Concorde cruising the wall between the cooker and the fridge. thank god I'm wearing my winter tights. Just like The Etymology of Azure, this is the kind of poem I would never have come up with on my own, though using this fun and clever technique I found all sorts of interesting words and phrases that have taken me somewhere new and different, exploring the wonders of our galaxy and the impossibilities of science. I enjoyed exploring a childhood memory, including my first piece of knitting after the obligatory 'square' that came out like a tattered rectangle. And Monday's are still very brown when filtered through my synaesthesia-tinted mind. How many others experience this? And with Mars a world away, it feels like the real question is: will it snow for Christmas? I haven't written much (any?) poetry this year, so my experience recently at Lumb Bank was a jump-start to my poetic creativity. Stevie Ronnie was our tutor for the poetry element of the Book Art & Text course (check out the amazing paper books I made under Rachel Hazell's tutelage), and he immersed the group in language and words (my very favourite kind of lesson) through ingenious tasks and short games, even making up new poetic forms - the snake poem anyone? - encouraging us to inject a bit more freedom and fun into our approach to poetry. For one of our lessons we had to write down our favourite word ahead of time, allowing Stevie to research the etymology of it and present us with the findings (though at the time we didn't know where the word was going to take us). From there, we had to construct a poem using only the words that featured in the etymology. And the etymology was fascinating - more like a history lesson through language, culture and geology via the Mediterranean and Turkestan. 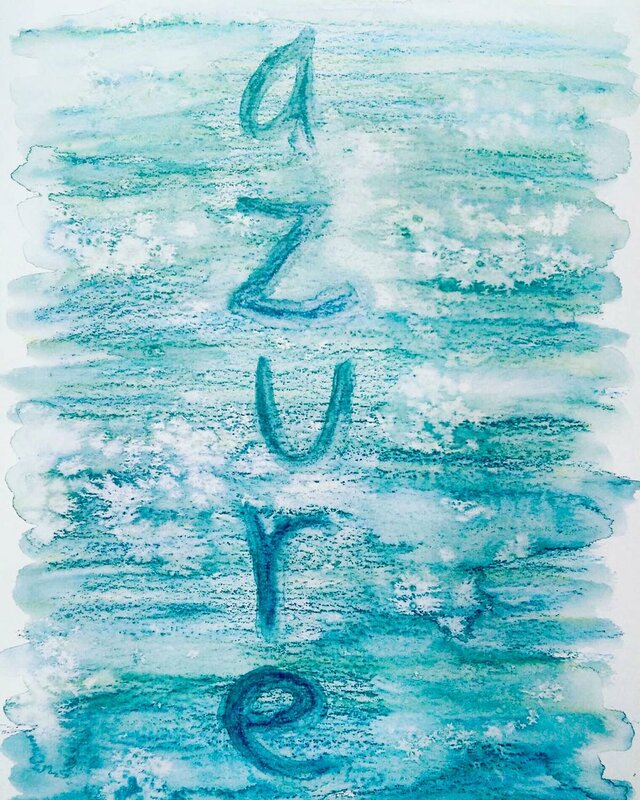 Azure is so much more than 'the blue colour of the clear sky'. Some of the words that jumped out at me from the etymology were words I would never have thought to include in a poem, and I loved how they related back to the word (obviously) but could be jumbled up to create the story of the word, as well as a story through the poem. They make it sound so much more complex and glamorous. I love that. 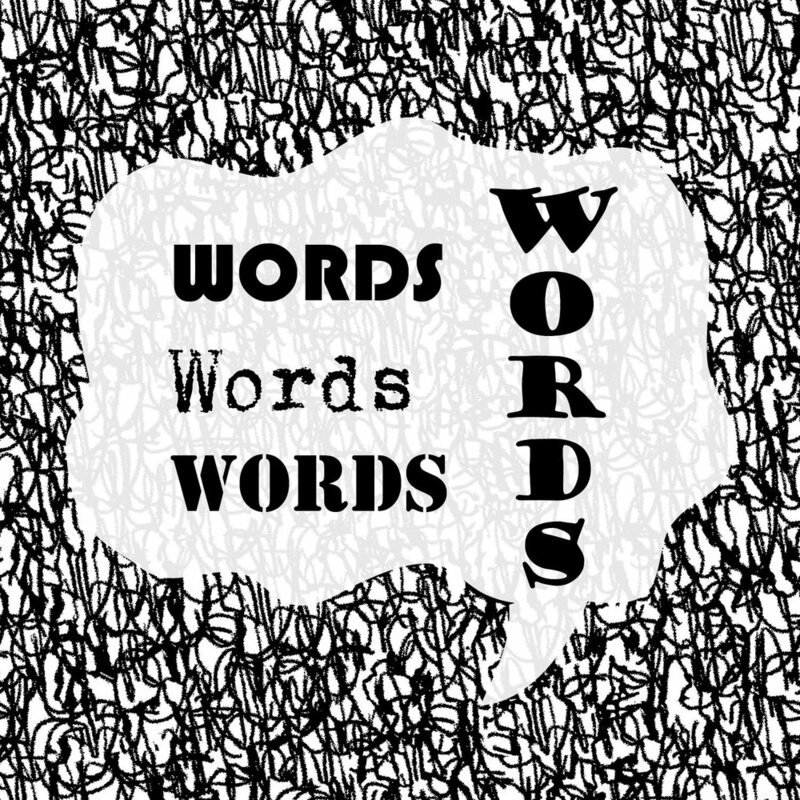 Words and phrases all with their roots in one word, but intensifying the meaning, shifting it, elevating it. The only thing I've allowed myself to change is the line structure - it's my area of weakness - and the title. I thought it fitting to call it Lapis Lazuli at the time, because azure is literally 'a genitive of lazulum', but then I realised the title of this post says it best. with limpets clinging to sticks. "sudden sharp hot stink of fox". Even better, The Poetry Archive has an audio recording of Hughes reading this poem in his own distinctive timbre. *Listen here*. That's all. I just had to share. I love foxes. The Thought Fox made me think. I'm reading a moving anthology at the moment by Bashabi Fraser titled Letters to My Mother and Other Mothers. In the first section of the book Bashabi's poems describe memories and conversations with her mother as 'a conversation that would have flowed', from the time before her mother had a series of strokes and subsequently died. Her words are careful and evocative and you can feel and taste all the vivid sensations of love, pain, hope, distress and wonder at this magical being that is 'ma'. I find human relationships infinitely interesting, and as a daughter myself, I can relate to her words (not least because my own mother experienced a sudden and debilitating condition a few years ago). I know what it is to have thoughts that flow in a stream of conversation; blossoming in that unique and intimate manner between a mother a daughter. She was the Sheuli in my wonderlandDiscreetly tender, fragrantly appealing. I love this melding of language and culture as Indian and Scots influences pepper the work. You invested thousandsto make that one journeyto clear the pathfor your dreamt-of son. The poem that has particular resonance for me (so far) is called 'Urban Gothic: London during World War II'. ...In this stone forest of silhouettesthe wan moon swoons in pirouettes...And girls from factories' smart retreatsWill click red shoes in rhythmic styleA ghost army marching in, to a soundless Doric tuneWill partner each dancing dream, unfolding beneath the moon. I'm delighted I discovered this beautiful collection. I didn't post a poem on Wednesday of this week because I knew all my thoughts of poetry would be centred around reading my poem Set in Stone at Jupiter Artland last night, as part of their Inspired to Write competition. The event was held in the ballroom of Bonnington House, which is not usually open to visitors of the art park, but was made available by the owner, Nicky Wilson, who was also a judge in the competition alongside current Poet in Residence, Marjorie Lofti Gill. Marjorie read some of the poems for shortlisted entrants who were unable to attend (some entries came from as far away as Egypt, Bolivia and America! ), while refreshments of chocolate brownies and hot, spiced mulled wine were the perfect accompaniment to the evening. My poem didn't 'win', but that in no way detracted from my excitement and enjoyment of the evening. In fact, some of the other poems that I heard really resonated with me and moved me and would have been deserving winners in my opinion, ahead of my own poem. The named winners were Jonathan Bay, Rafael Torrubia and Jean Taylor. As Marjorie suggested last night, poetry is a very personal, intimate medium in which to convey thoughts, ideas and visions, and so we all left with our own 'winner', or few, in mind. My poem was inspired by Laura Ford's Weeping Girls,which inspired a number of other entries too. Their haunting lair under the trees is just so evocative. I particularly enjoyed seeing Nathan Coley's installation 'You Imagine What You Desire' lit up at night, which was in full view from the ballroom during the event. I tried to get a photograph but only had my phone camera to work with so the illumination of all the bulbs resulted in a flood-lit blur against the black sky. It was just magical to enjoy it while I was there. Nicky suggested some of the poems would be added to the Jupiter Artland website next to the images and descriptions of the works, and the recording of the evening is apparently going to be broadcast on Australian radio - how fabulous! With it being a permanent art collection, the different tangents and interpretations of each piece that inspired a story or a poem have created a whole new buzz, and I can't wait to return and experience the wonder of it all again once it reopens in the Spring. I chose the raven as the subject of the poem because I always feel birds are so intuitive and carry messages through the skies. Ravens particularly are also harbingers of fate (doom? ), destiny and magic. January feels like a somewhat fateful, dark and brooding month. He stayed a while, then flew away. strutting back and forth in my window bay. He stayed a while then flew away. Wednesday slipped by without a poem, yet it's OK, because, you know, life. It wasn't so much that there was nothing to share, more that the holidays have jangled up days and dates and routines. Let your life be a poem. I just LOVE it. Those few words feel magical. Simple, but magical. I'm currently reading The Siege by Helen Dunmore (Leningrad is surrounded and food rations are dwindling. I've had this book for over a year but I've never been able to get by the first few pages - because the right time to read it was not then, but now). ...Tatyana is lost in her dream. The plains, the fir trees, the ghostly light and the creak of her footsteps in the snow: all these come to me so powerfully that it's as if I'd never really read about them or thought about them before. I almost say aloud that I'm sorry I didn't understand until now. My eyes fill with tears, and I don't know why. But I know that it's by these things, and nothing else, that we survive. Poetry doesn't exist to make life beautiful. Poetry is life itself." I can almost hear 'the creak of her footsteps in the snow', and that indeed is poetry. Collage Club: What is beautiful? Great topic & discussion :) Colourful & delightful! Void of your head:/inconsolable." The Autumn Pages Matcha makes mornings manageable! I've never composed a sonnet before, and I think this one is a perfect insight to my Twitter feed and the exclamation mark of excitement that is often my internal world. The final stanza is my favourite. I love the nostalgia of Christmas, and particularly the memories of Christmas past, however rose-tinted they may be. I always wrote a huge list asking for all sorts of wild and wonderful gifts, like any child, but it was never just about the presents. the start of a fire. just a promise of bliss. Quite spicy for a Wednesday! This week's poem comes via the Jupiter Artland website, where my poem (amidst a selection of other entries) is published as part of the 'Inspired to Write' competition. 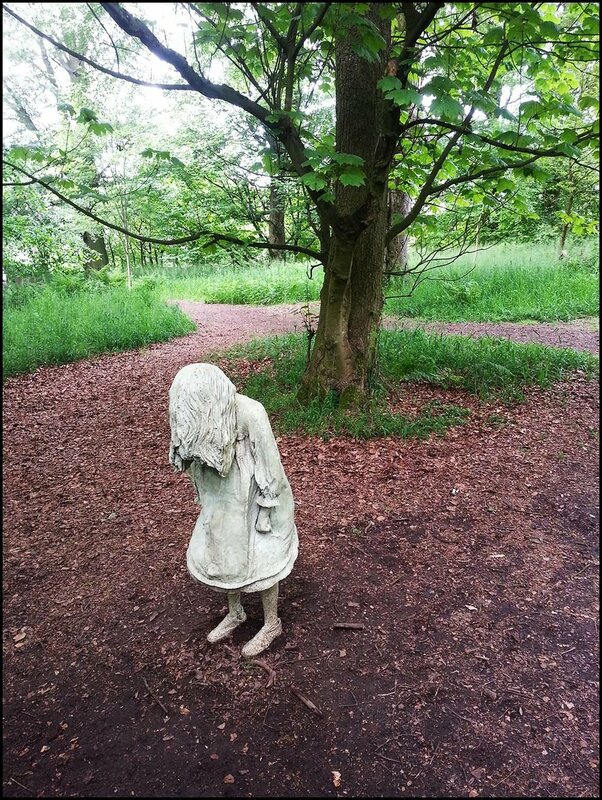 The competition asked for poetry or prose inspired by one of the installations at the park, and I couldn't ignore the lure of Laura Ford's 'Weeping Girls'. What made the experience even more surreal and memorable was that a young girl visiting with her family was interacting with the weeping girls, standing in front of each statue as if they were real girls. This girl looked to be a similar age, was the same height and had long, wavy hair. It felt like part of the installation to experience this interaction, and in the shady setting under towering trees, it made for a strangely haunting experience. When I heard about this competition (thanks Vikki! ), I couldn't wait to enter. When it came to it, I was so busy focusing on my novel, I didn't really leave myself much time. Reading over my poem again with a few weeks of distance (read: objectivity), although I still like it, there are a few elements of the punctuation I would change that would make the rhythm read better, but I'm still really glad I entered. Jupiter Artland is now closed for the winter, but reopens again in the spring. I loved the experience of an intimate, basement gig and wrote this poem the next day. I just re-discovered it and my own words took me right back to that night, the experience of music reverberating, echoing, pulsing all around me. The lovely Gwenno was rather pregnant at the time (likely due around now), hence the title. Her dress was sparkly and amazing and reminded me of a beautiful helium balloon that I had once as a child. The balloon was in the shape of a fish with metallic scales of emerald and sapphire, and my parents had taken me to the London Palladium for my birthday. I don't remember what we saw but I treasured that balloon long after it fell from my bedroom ceiling to loll on the floor. Colours inspire me and music inspires me and man I wish I'd bought Gwenno on vinyl! I wasn't familiar with 'Ode on a Grecian Urn' by John Keats before I read the debut novel 'Follow Me' by Victoria Gemmell. An extract of the poem appears three-quarters of the way through the book and fits the story perfectly; a story centred around the deadly allure of the 'Barn' which re-imagines Andy Warhol's Factory in the fictional Scottish town of Eddison. The story starts in the aftermath of Abby's apparent suicide - the fifth in the small town within a year - and which her twin sister Kat struggles to believe can be the truth behind her death. As we step further into the 'deadly allure' of the Barn, into the underground art world constructed by both Michael and Rob, the dialogue pops from every page, rooting the story in action and drawing us deeper into the secrets of Eddison woods until the final twist. I know I would have loved going to the Barn as a teenager, immersing into a more adult world, the heady creativity of the art scene: poetry, music, the smell of paint fresh on a canvas and of mysterious college boys playing in a band, a dark layer of mystery in their eyes. Oh I wish I was a teenager again! OK, maybe not...but I definitely loved being drawn into this gripping Young Adult story. I was even able to meet Ida, the designer behind the cover art for Follow Me at the book launch in Waterstones, and get a signed 'first edition' of the novel which feels very special. Holding a book in your hands, a real book, and having it signed by the author is a tangible modern-day magic in today's digital world. The idea of being 'famous for fifteen minutes' (or even fifteen seconds) is very alluring for many of us, turning the spotlight on today's celebrity-obsessed society. Would you have been lured to the Barn, or stayed away? Read a Q&A interview with Victoria and get an insight into her inspirations and writing process. NB: I know Victoria personally and am delighted to promote her debut novel on this blog. This is not a sponsored post. Today I woke with the urge to cook and bake and prepare food. I've been away from home for a few days so perhaps the break inspired this bout of kitchen domesticity? I started with a pot of soup, scrubbing the carrots I harvested from my own garden. I bashed the earth from the roots, sliced the greenery from the top and scrubbed the bent-up carrots I planted too-close-together feeling an immediate sense of nourishment and gratitude in the pungent carrot-y smell. It took longer than I thought - to sort the gnarled twists into clean, peeled fodder for my meal. But it was satisfying. I had onions and herbs, a clove of smokey garlic, oil and butter and sundried tomatoes and a few potatoes that I added to the mix. I had flour in the cupboard and porridge oats and oatmeal and a few scoops of light brown sugar and so while the soup was bubbling away on the hob, I measured the ingredients for bread and for oatcakes and the morning was cold, frosty with a dampness in the air, yet my little kitchen was hot and steamy with the creation of lovely autumn comfort foods, made with the scarcest of ingredients. When the bread and the oatcakes were in the oven I melted more butter and squeezed out a tablespoon of golden syrup and greased a baking tray for the flapjacks. I don't like to use as much sugar as the recipe suggests (an idea I got from the lovely Lila), so I swapped 75g of sugar for 50g of toasted almonds, and it felt a bit like alchemy because I like to switch things up but I have no jurisdiction in the kitchen; no knowledge of what might happen or go wrong like I do when I'm sewing or writing. And I know that baking is a precise science. I kept the radio on and chopped and kneaded and rolled, listening to the Stereophonics and Muse and Moby and others I can't remember because I was lost in the flow, and by the time I was finished the sun was coming out and it was time for a cup of tea and I'd made a little feast that filled the house with a cosy warm breath of happiness. Everything turned out OK, well, better than expected or perhaps just as expected if I'd paused to consider what that might be? I used a heart-shaped cookie cutter for the oatcakes, and I had the soup for lunch with a hunk of fresh bread and I was going to take a photo but I was too hungry to care. leaving traces in the bark. as the knife cuts through? The night is dark and loud. O, dark and loud's the night! These words speak to me as much now as they might have done when they were first written in 1876. Poetry has no use-by date. Words live on. A Kindle can't ever hope to convey this kind of personalised message; the fading, often illegible script of someone taking the time to inscribe good wishes or friendship or love, and write the date, marking that moment forever in time. For me, there is a beautiful poetry to that simple act, all in itself. Henley also made a dedication to his wife, itself a poem. Reading these words more than a hundred years later does nothing to strip them of their intimacy and intent, which leaps from the page as if the ink were still wet or the words being spoken by Henley himself, right now. So I suppose, this post is a celebration of both poetry and books. Words handwritten or printed on carefully chosen paper. Works of art, words of art, undiminished by the passing of time. Thanks to National Poetry Day for reminding us to celebrate the poems of our time and the poems of the past, while nurturing the poets of our future. On that note, why not dedicate a poem to someone you love? Or revisit this beautiful ode to the lakeside solitude of Cadenabbia, Italy by Henry Wordsworth Longfellow. Or my own ode to the Supermoon. Poetry is the salve of the soul, capturing meaning and emotions, and deciphering the puzzle of life. It's the 'Season of Words' with Get Messy Art Journal, and I usually post my journal pages here. WORDS are my passion of course, especially on this blog, so I'm posting my latest attempt at blackout poetry, inspired by the work of Austin Kleon. I 'found' it on a random page of an altered book. The book is a hardback edition of 'Elegance' by Kathleen Tessaro, which I've reworked into 'The Elegance of Words' for my own #getmessy purposes. I turned the first few pages, scouring for attractive adjectives, nouns, adverbs. And then I tapped the page with a retractable pencil, eyeing up the inspiration until I was ready to scratch out superfluous words with a gold Sharpie. Last night. In the living room. By the glow of a paper IKEA lamp. Blackout poetry is SO much fun - it's amazing what you can find inside the words of others, the hidden poems waiting to be discovered, especially from the kind of text you might not usually read. Check out my other experiments with found/blackout poetry using an article from a fashion glossy, Linux magazine, Tolstoy's Anna Karenina, Tarot-etry and the amazing fun of Paint Chip Poetry. I had this dream the other night that I wrote down as soon as I woke up in a crazy, scribbled, early-morning-handwriting. The vision of it is still so strong in my mind as if it were a calling, some kind of prophetic message. A sense of something... higher, or a veiled message from my subconscious. And the aerial view of it was so different to any dream I've ever had before. A white cloud is hanging above the mountains - the Alps or the Pyrenees or the Himalayas - and the pin-pricks of the mountain peaks appear tiny: icing bobbles on a cake, snow, edible baubles; picturesque, white and frosty. The cloud is high up above the world, spiritual and all around me, white and blue and green. White mists, white snow, blue skies, a river below and green trees peeping up through the white, their green tips just visible. And then crystal rain-drops sprinkle down slowly on the mountains, but not enough that it melts the snow. I am the light, twitching, bright, sparkly. I am the cloud. I know just before I wake up that I am the cloud. It all felt very poetic and silent and beautiful. And the image was very specific to the point I would recognise it if I saw it again (in a dream or reality). But I'm not sure what it means? I've tried to photograph the moon before, but she's elusive and mysterious and I don't understand the settings on my camera well enough. Last night the moonlight shining into my room was so bright I had to get up and get my camera and try again. It couldn't focus on the bright white of the moon at the same time as the street-light pollution, but I wanted the image to have some perspective. I quite like them, even the blurry ones. They echo the magic of the experience of the moon. And although many people think it's nonsense, I often have a very heightened emotions and experiences - good and bad - at the time of the full moon. Pisces wants everything to be an epic romance movie and this makes them very open to wooing"
I stare, fall, come undone, under the spell of your silent song...and then I remember: because I'll never forget I wear the moonlight inside my eyes." Are you affected by the moon? And most importantly, watch out - these portents for the Super Blood Moon are scary! The amplified nature of this moon may have you at your wits’ end, but there’s an essential depth to this lunation: Every one of us will be asked to feel deeply—the challenge is to remain rational and in control. Tidal patterns, animal behavior, and yes, total loonies will be stronger and seem much more bizarre with a perigee or “super” moon. Full moons have illuminating effects and can reveal information—especially about hidden aspects of ourselves and those closest to us.